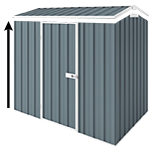 This Workshop range of our garden sheds is manufactured from low maintenance ribbed steel sheeting and designed for long lasting quality. This zinc YardPro Nova Portal Frame 260C Workshop is the ideal building solution if you are a serious home handyman. This ultimate man cave has additional floor space and enough head height so you can comfortably move around while keeping the things that you love in safe. NOTE: This workshop shed takes about 3 weeks to get manufactured.